It’s a bird. It’s a plane. It’s… kinda both? When you need a model for how to make something that flies, there’s no need to look to science fiction. Nature’s got plenty of examples. A pretty good one? Birds. Flying is kind of their thing (for most of them, anyway). So when researchers from the Étienne Jules Marey Institute of Movement Sciences (CNRS / Aix-Marseille Université) set out to design a new kind of aerial robot, they were a natural place to turn for inspiration. The result: the world’s first aerial robot that can change its shape mid-flight, just like a bird can. The researchers published their research Wednesday in the journal Soft Robotics. To fit through a narrow space — between two trees, for example — an aerial robot would have to rotate its entire body 90 degrees, so that it was vertical with the ground. That robot would have to be light, small, and moving fast — that helps it avoid losing too much altitude while its propellers aren’t providing lift. It must also have sensors with high refresh rates. Otherwise, such an aggressive move could affect the robot’s ability to keep track of its position so that it knows when to right itself. But there’s a better solution. If a real-life flying bird approaches that narrow tree gap, all it has to do is pull its wings closer to its body for as long as it takes to pass through. Simple enough. Now that’s exactly what Quad-Morphing can do. Quad-Morphing’s got two arms with two propellers on each, so it flies like a helicopter. 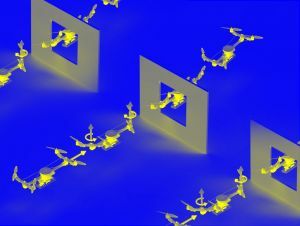 A combination of elastic and rigid wires attach the arms to its body, which give the robot the ability to retract those arms, cutting its wingspan by 48 percent in just 250 milliseconds. An autopilot mechanism controls the extension and retraction of Quad-Morphing’s arms as needed, but the bot relied on the testing room’s 3D localization system — a series of 17 cameras recording its every move — to know when it was approaching the narrow gap. In the real world, that’s not going to fly. The researchers have since equipped the bot with a small camera capable of snapping 120 pictures per second. This should allow it to “see” the gap on its own and change position accordingly. The researchers plan to test this within the month. In the future, the researchers say their bot’s morphing ability could prove useful in exploring difficult-to-navigate territory. It could also help in search and rescue missions, such as locating missing hikers. And, really, a bot that can navigate a forrest as deftly as a bird is perfectly suited to the task.